Exploding Transformers – More than meets the eye? Between the mass animal deaths, the deadly earthquakes and tsunamis in the Pacific rim, the record-settingextreme weather across the US, and the once meandering gulf-stream nowshutting down, clearly something is up on the big blue marble this year. And now we may have a new one to add to the list: exploding transformers. In the last couple weeks numerous electrical transformers have malfunctioned or exploded, in some cases causing major fires. Many of these are not your usual explosions either; some consisted of an almost fireworks-like display of electrical arcing as shown in some of the videos below. Given the sheer number of out-of-control transformers, this appears to be a new phenomena, or perhaps a sign of things to come. With the connections we’ve noted between electrical activity in space and major events such as tornadoes, cyclones, volcanoes and earthquakes, one might suspect that the same electrical phenomena responsible for these displays of nature’s fury could be responsible for these exploding transformers too. 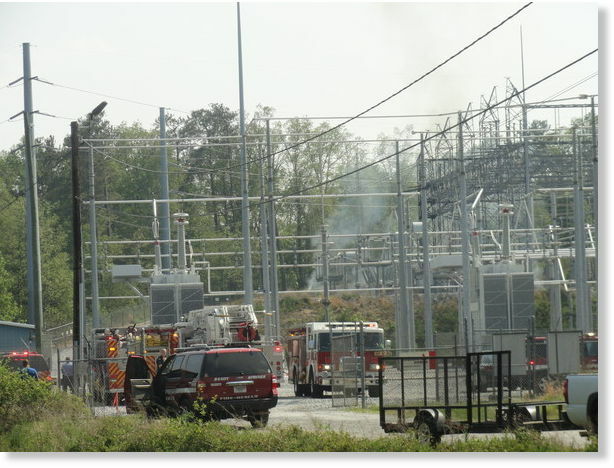 Typically large spikes in electrical current are the cause of transformer explosions. It seems that, like the exploding transformers, our planet is being electrically overloaded in ways it can’t properly handle either, causing all manner of weather and ground-shaking chaos. Perhaps what we’ve seen so far this year in terms of crazy weather and earthquakes is only the start of things to come. TORRINGTON — A transformer fire near the corner of Route 202 and Litchfield Street knocked out power for more than 1,200 Connecticut Light & Power customers early Wednesday morning. 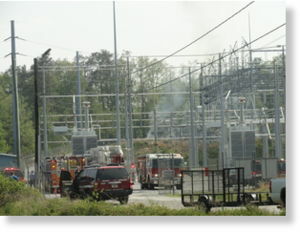 CL&P spokesman Mitch Gross said the fire broke out about 2:45 a.m. and affected 1,290 customers for almost 2 hours. The power to all but 20 customers was restored by 4:30 a.m., he said. 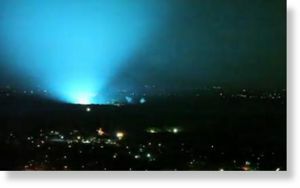 FORT WORTH – Several electrical transformers exploded and sparked east of downtown Fort Worth Tuesday night, making the city look like it was under attack. Although electrical service provider Oncor has not provided an update on exactly what happened, it is presumed that lightning from one of the storms that rolled through Tuesday evening struck one of the transformers and sparked a chain reaction of explosions. 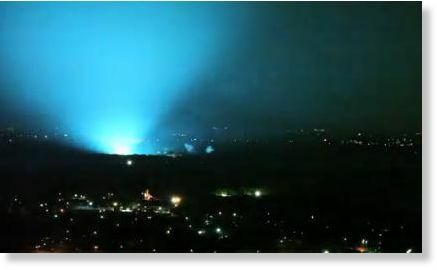 Watch the video below, shot from the 34th floor of The Tower Residences by Brian Luenser between 9:30 p.m. and 10 p.m.
Folks in the area said they heard a loud noise and saw a plume of smoke when a transformer blew just before 4 p.m., Thursday, at the Georgia Power substation off Morgan Falls Road. Fire Rescue, Police and Georgia Power were at the scene. Meridian, Connecticut. — Hundreds of fingers are crossed at a condo complex in Meriden, where residents have been waiting for more than two weeks to get back into their homes after a transformer fire knocked out electricity and other problems were uncovered. St. Charles County – Authorities believe a transformer fire near the county’s fire and ambulance dispatch center in Wentzville about 3:45 p.m. today caused a power surge that tripped tornado warning sirens from the dispatch center for about three to four minutes. Las Vegas, Nevada — Las Vegas police said it took about two hours to clear up a traffic mess caused by an electrical transformer explosion behind the Monte Carlo casino. The blast and resulting fire created a cloud of smoke that shut down the northbound lanes of Interstate 15. Metro Police told the Las Vegas Sun there were no injuries and Monte Carlo guests had to be evacuated. The cause of the explosion, which occurred around 12:30 a.m. MDT, was not known. An Upper Providence home was damaged by a reported transformer fire that spread to the residence early Monday morning. The fire in the house at 117 Old State Road was reported shortly before 3:30 a.m. by a PECO employee in the vicinity, according to Sean Perry, Deputy Director of Public Safety Communications and Technology with the Montgomery County Department of Public Safety. Heavy thunderstorms moved through the area on Sunday night into Monday morning. George Gilliano, assistant engineer with Friendship Fire Company of Royersford, said the fire spread from the basement of the home up to the first floor. Gilliano said he was not present at the scene and described the situation as he understood it from other members of the department. STAUNTON – A transformer fire this morning shut down power to half of Lee High, according to the Staunton City Schools’ central office. McSwain Elementary School was not affected by the power outage. Superintendent Steven Nichols is preparing a parental notification for the system’s phone alert system, said Brenda Lovekamp in the central office, who also confirmed the reported power outage. Now I’m sure there are those people out there thinking, “Gee, I thought transformer explosions happen all the time, how is this so important?” There’s certainly some truth to this, but there is also reason to suspect things may be different now. There does seem to be a noted increase in significant “transformer explosions” since the beginning of the year. Although this is by no means a scientific survey, a cursory search on Google News for the phrase “transformer explosion” from the first of the year till the present returns a hearty 24 results. The same search on the entire year of 2010 returns 25 resultsand then only 20 results for 2009. So, if this search is any indication, we’re well on pace to double the number of stories about transformer explosions this year compared to the last two years. A similar trend can be seen with the search phrase “transformer fire” too. Now there is the possibility of older stories getting dumped from the news sites, as well as the fact that this search is limited to US stories too, so one must take these factors (and probably others) into consideration. But for a “transformer explosion” to make the news, it would have to be significant in some way; either causing a large fire, starting a major power-outage, or creating a lively public scene. Most garden-variety transformer explosions do not make the news; electrical companies are called into fix exploded transformer boxes on power lines every day. In any case, when looking at the big picture, one can definitely see an increase in earth-changing events across the board since the beginning of this year. Focusing on transformer explosions alone isn’t the point. The most likely scenario that I can see is that the number or power of lightning strikes has increased, thus causing an increase in the power surges that trigger these transformer fires. But whether lightning is the actual cause of these fires or if there is some larger phenomena to take into account, it is hard to say at this point. Even if lightning is all there is to it, the exploding transformers are still noteworthy. The main point to consider is that something big is happening, or about to happen, and changes in the electrical environment of our planet may play a larger role than most suspect.